Ben Graham, the father of value investing, once said: 'The investor's chief problem-and even his worst enemy-is likely to be himself.' Sadly, Graham's words are still true today. Bias, emotion, and overconfidence are just three of the many behavioral traits that can lead investors to lose money or achieve lower returns. Fortunately, behavioral finance, which recognizes that there is a psychological element to all investor decision making, is now firmly embedded in the mainstream of finance. Applying behavioral principles to an investment portfolio can help investors avoid some of the mental pitfalls that so often cost them, and financial institutions, billions. 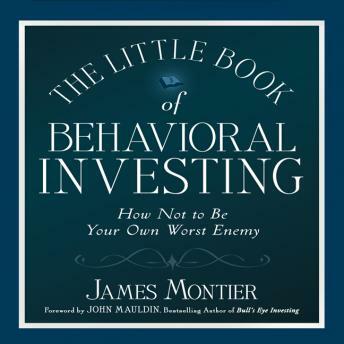 In The Little Book of Behavioral Investing, behavioral finance expert James Montier takes you on a guided tour of the most common behavioral challenges and mental pitfalls that investors encounter, and provides you with strategies to eliminate these traits. Along the way, he shows how some of the world's best investors have tackled the behavioral biases that drag down investment returns, so that you might be able to learn from their experiences. Montier explains the importance of learning to prepare, plan, and then commit to a strategy-that is, do your investment research while you are in a 'cold' rational state, when nothing much is happening in the markets-and then pre-commit to following your analysis and action steps. He also stresses the folly of trying to forecast what the markets will do, and reveals how the idea of investing without pretending you know the future gives you a very different perspective. Throughout the audio book, Montier stresses why the need to focus on process rather than outcomes is critical in investing. Focusing upon process, he shows, frees us up from worrying about aspects of investment that we really can't control-such as returns. By focusing upon process, we maximize our potential to generate good long-term profits. The Little Book of Behavioral Investing offers a range of time-tested ways to identify and avoid the pitfalls of investor bias. By following these simple strategies, you will learn to overcome your own worst enemy when it comes to investments-yourself.